"Omnia mea mecum porto." – "All that is mine I carry with me." Read Full Description. This 2000-year-old quotation by the philosopher Bias of Priene could not be more relevant today. This is because the true treasures are within us: they can be seen in our talents and actions, heard in our words and we feel them in each of our emotions. In short: they are what make us unique at heart. All of these factors are combined to make Omnia, the newest creation by Tarnoki. Decorated with the phrase "omnia mea mecum porto", this perfectly structured necklace symbolises people's trust in themselves. Whoever wears Omnia shows to the outside world what they know on the inside: I have trust in myself, my strengths, my sense of perception and my wishes. I am exactly the person who I want to be. This knowledge makes me even happier and stronger because I am at one with myself. Omnia Relief is made of 925 silver and has a tactile pristine surface due to the embossed font. 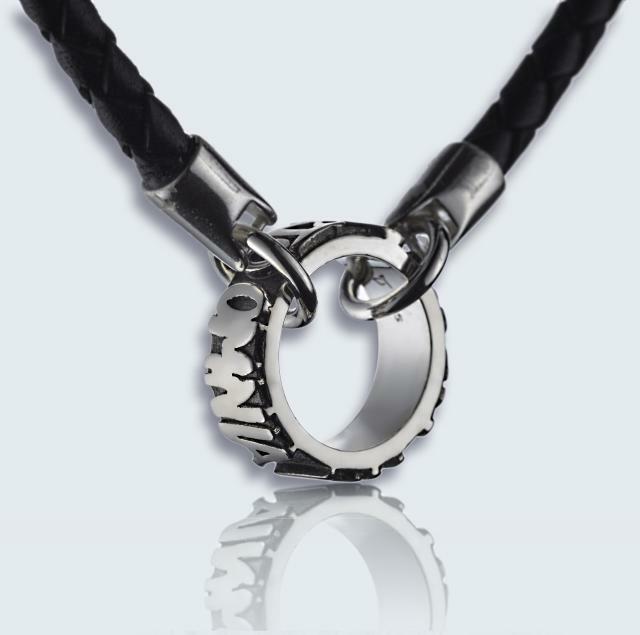 Both the phrase and the letters symbolise the wearer's uniqueness as they are raised in shiny silver from the black background. The lettering used is unique – it is one of the goldsmith's personal fonts. In order to make the ring rotatable so that the saying can be read in its entirety, two eyelets link the ring to the exquisite leather necklace.